The Panzer III was intended as the primary battle tank of the German forces. However, when it initially met the KV-1 and T-34 tanks it proved to be inferior in both armour and gun power. To meet the growing need to counter these tanks, the Panzer III was up-gunned with a longer, more powerful 50-millimetre (1.97 in) gun and received more armour although this failed to effectively address the problem caused by the Soviet tank designs. As a result, production of self-propelled guns, as well as the up-gunning of the Panzer IV was initiated. The Panzer A was basically a prototype and of the ten built, only eight were armed and most of those saw combat early in the war. 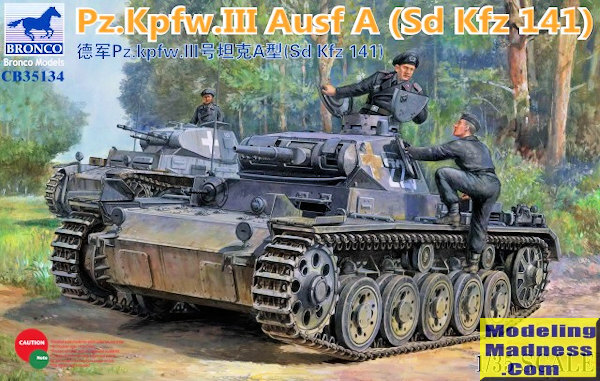 What with all the 'normal' versions of the Panzer III having been kitted by pretty much everyone who does armor in this scale, it was only a matter of time before the early versions would finally kitted. These are easily spotted by enthusiasts due to their spring suspension and smaller road wheels. 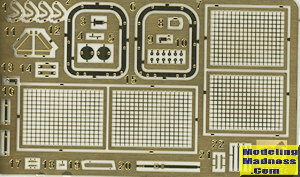 Bronco's kit has no interior, but like other Bronco kits, it has a zillion small parts. Some of these are plastic, some are photo etch, but most of them are connected with the individual track links. These have separate pins on the inside and out, so you can see where you'll be spending a good deal of time. Bronco does provide a build tool to help so it isn't all that onerous. Options provided with the kit are open or slit covered head lights, the ability to have the front and rear fenders folded up, open or closed upper turret hatches, and open or closed turret machine gun and aimer's hatches as well as the windows on the commander's hatch. Interestingly, the turret mounted machine guns were a pair of MG 34s. The lazy could mold the openings in the hatch for these closed, but if you are going to build a kit of this complexity anyway, it would be a shame to hide these. Other than the usual braces and brackets, the photo etch fret's largest bits are for the engine screens. I'd be remiss if I did not mention that each of the suspension spring assemblies is three parts with quite nicely molded plastic springs. Though there is no interior, the two forward hatches can be modeled open. Despite the lack of an interior, the inside of the turret	 provides full breech detail as well as a gunner's seat and a few other turret interior handles and other bits. 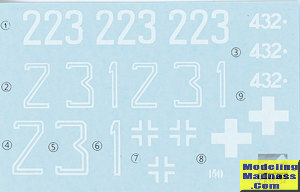 Instructions are very well done and you are provided with four 'unknown unit' markings from 1938 to 1940. All are in a basic panzer grey with the 1938/39 option also having a disruptive red brown camouflage. One is from the Polish campaign with the solid white crosses as shown on the box art. 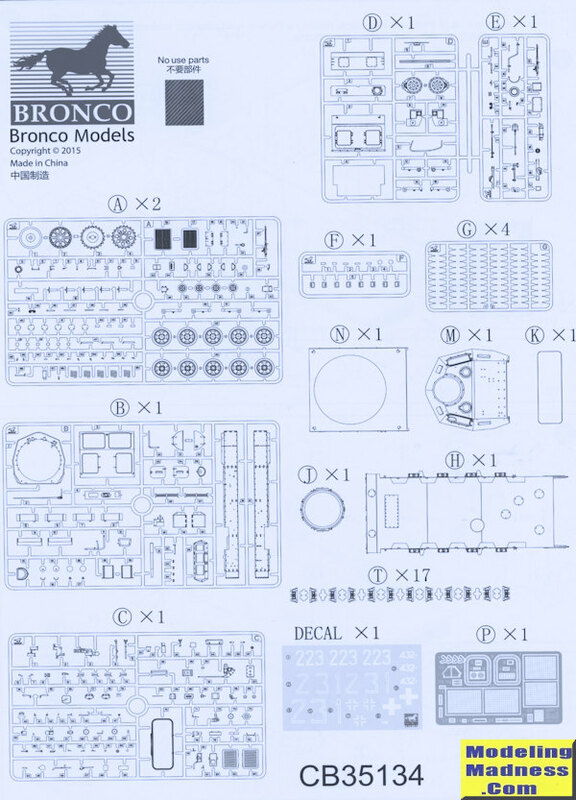 One thing about Bronco kits is that you always know what you are getting and you know that it will take time to build. This one fills an important gap for any Panzer III enthusiast. Thanks to the similarity of the early Panzer IIIs, I don't doubt that others will soon be available from Bronco. 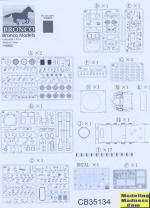 Thanks towww.dragonmodelsusa.com for the preview kit. You can find this one at your favorite hobby shop or on-line retailer.